Property Size 450 sq. 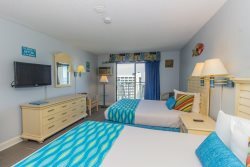 ft.
Beautiful ocean front condo located at the Sea Mist Resort. This studio condo offers 2 full size beds, TV, brand NEW flooring, NEW paint, NEW A/C unit, private bathroom, full size fridge, stove, microwave, and a private balcony with endless views of the Atlantic Ocean. This unit will comfortably accommodate 4 guests. We also have cots that can be rented to accompany an additional guest. Our guests will enjoy access to over 10 pools, hot tubs, sauna, arcade, and beach access at the Sea Mist. We look forward to having you! As our guest, you will have access to over 12 indoor and outdoor pools, hot tubs, saunas and beach access. Unfortunately, our guests do not have access to the water park, theatre, laundromat or fitness center.